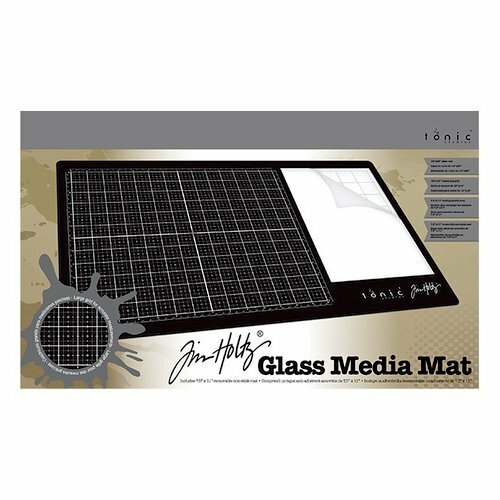 Measuring 14”x23” with a sleek black surface, the Tim Holtz Glass Media Mat is a fantastic multi-functional tool for creating on your workspace. 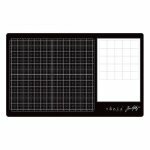 The 12”x14” measuring grid features imperial and metric measurements, and the white 7.5”x11” mixing palette area (complete with a durable non-stick mat) is ideal for preparing wet mediums. In addition to the Media Mat, the range includes a Replacement Non-Stick Mat and a Media Tool Set, complete with a Media Scraper for removing material from your non-stick mat and the Media Edge for drawing and cutting.